Sometimes while you are editing something on Audacity and suddenly it crashes. It makes you think that you lost all of your unsaved data. But you are wrong because in the event of a crash while Audacity has unsaved data, Audacity will attempt to recover that data on next launch from an autosave recovery file. If there were no unsaved changes at the time of the crash, there will be no recovery dialog – all you need to do is re-open the saved AUP file. In this box, you are going to see recoverable projects which include the date and time of the autosave file, preceded by either the name of the project or by “New Project” for a project that was never saved as a .aup file. The three buttons which you are seeing in the above picture has specific functions. When you click on the Quit Audacity button it is going to Exit Audacity without any changes. 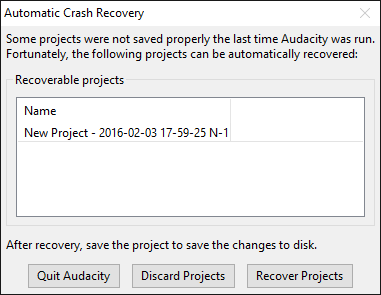 The Automatic Crash Recovery dialog will reappear next time you launch Audacity. When you click on the Recover Projects button it is going to try to recover the unsaved data for all projects and load the recovered waveforms. If there are many unsaved projects each one of them is going to recover into their own project window. It should be kept in mind that the project history is not recoverable, so you can only recover to the project state at or just before the crash. It should be noted that it is quite common if there are unsaved changes at the time of the crash for Audacity to warn of “file inconsistencies” when recovering the project. This basically indicates that there are “orphan block files” in the data that were there to enable undo or redo of a project action but which are now superfluous to the recovered project. If you see such a case, you are going to see a note on opening Help > Diagnostics > Show Log that orphan files are going to be removed on saving the project. The data is still in unsaved state, after the recovery. If the recovery is successfully done, use File > Save Project > Save Project to save the recovered project. ← How to import files from iTunes? Disclaimer: We're not affiliated with The Audacity Team or any of their respective developers.